Cologne, Germany, August 5, 2015 – EIZO Corporation (TSE: 6737) today announced the FORIS FS2735, a 27-inch gaming monitor with a 2560 x 1440 resolution, 144 Hz refresh rate, IPS (in-plane switching) panel and AMD FreeSync compatibility. EIZO is combining cutting-edge hardware performance with its own new smartphone and cloud-sharing solutions called G-Ignition for a more integrated and enjoyable gaming experience. With the announcement of the FORIS FS2735, EIZO is unveiling two new additions to its G-Ignition software solutions: G-Ignition Mobile and G-Ignition Drive. G-Ignition Mobile is an iOS- and Android-compatible application that works with Bluetooth Smart technology built into the FORIS FS2735. For the first time, gamers can use their smartphones to adjust the monitor’s brightness color, preset modes, and other settings when the FORIS FS2735 is connected to any platform be it Windows, Macintosh, or a console. Gamers can also enable G-Ignition Mobile to post a notification in the corner of the FORIS F2735’s screen whenever they receive a call or message on their smartphone. Gamers who use headphones no longer have to worry about missing an important call or e-mail because they could not hear their smartphone’s ringtone. Like the FORIS FS2434, the FORIS FS2735 is equipped with EIZO’s own Smart technologies to improve visibility and clarity. In addition to a 144 Hz refresh rate, the FORIS FS2735 utilizes two technologies to produce the smoothest image display on a gaming monitor. The first is EIZO’s motion blur reduction feature that controls the blinking of the LED backlight. The second is compatibility with AMD’s FreeSync variable sync technology to eliminate stuttering and tearing. 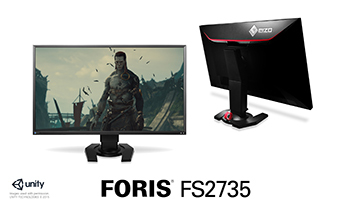 Besides gaming, the FORIS FS2735 is ideal for other uses such as casual photo, watching films, web surfing, and reading documents. The monitor comes with Game, Cinema, Paper, sRGB, and user adjustable modes. EIZO will also upload custom settings for graphics use to G-Ignition Drive. Reduced blue light with Paper mode so documents can be read more comfortably. *The usage time is limited to 30,000 hours from the date of purchase. All product names are trademarks or registered trademarks of their respective companies. EIZO and FORIS are registered trademarks of EIZO Corporation.